One of my favorite morning rituals is having a cup of espresso before I head out the door. Since I’m all about efficiency (business background here), espresso gives me that extra punch in the morning in one little shot. I buy the ground espresso cans so it’s an easy process to make a cup. 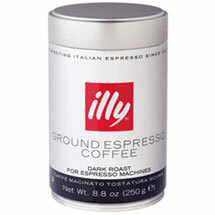 If you drink coffee/espressos, I highly recommend Illy coffee, particularly the ground espresso coffee. The medium roast is the perfect blend of robust taste and a smooth finish. Try one of Illy’s amazing Italian coffees or espressos!